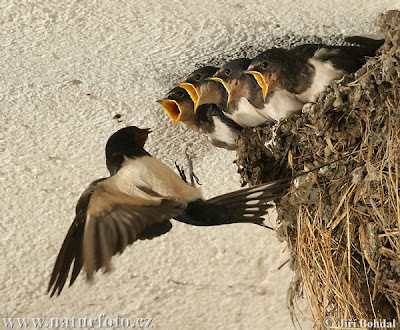 Barn swallow Hirundo rustica, photographed by Jiří Bohdal. The genus Hirundo includes the barn swallow H. rustica, welcome swallow H. neoxena, and related species. Authors have differed in the circumscription of this genus: at its broadest, it may include nearly all the hirundine swallows. Species of Hirundo as recognised here generally have blue upperparts, rufous throats and pale underparts, and build their nests as open cups. The crag martins (Hirundo rupestris and related species), sometimes separated as the genus Ptyonoprogne, are dark brown or grey in colouration. [Scl66] Sclater, P. L. 1866. Report on birds collected at Windvogelberg, South Africa, by Capt. G. E. Bulger, C. M. Z. S. Proceedings of the Zoological Society of London 1866: 21-23.